Background: The prevalence of obesity is increasing worldwide. Herbal medicines are one of the most common alternative therapies for weight loss. The aim of this study was to determine the usage rate of herbal medicines in the city of Taif, Saudi Arabia, and which plants were most commonly used to treat obesity. Materials and Methods: This is a cross-sectional study conducted using a pretested questionnaire that was randomly distributed to overweight and obese people in Taif, Saudi Arabia. Results: A total of 422 cases completed the questionnaire with a response rate of 60.3%. The majority of patients (98.1%) used herbal medicines to lose weight, with green tea (88.4%) and ginger (29.5%) being the most commonly used herbs. More than one-third of respondents declared that they suffered from side effects; however, most (72%) of the respondents admitted that they would use herbal medications again. Conclusion: The current study shows a high usage rate of herbal medicines for the treatment of obesity in Saudi Arabia. However, further studies are needed on the risks and benefits of the use of herbal medicines to treat obesity. Pharmacists and health professionals should conduct a community-based awareness program to spread awareness of both the benefits and risks of medicinal herbs. تعتبر الأدوية العشبية من أكثر بدائل العلاج لإنقاص الوزن. تهدف هذه الدراسة المقطعية إلى التعرف عن معدل استخدام هذه الأدوية وأنواع النبتات المستخدمة لعلاج السمنة في مدينة الطائف بالمملكة العربية السعودية. تمت الدراسة باستخدام استبانه وزعت عشوائيا على المصابين بالبدانة والسمنة في مدينة الطائف. وضحت الدراسة معدل استخدام عالي للأدوية العشبية لعلاج البدانة. أوصى الباحثون بإجراء المزيد من الدراسات عن فوائد ومخاطر هذه الأدوية ومن ثم توعية المجتمع عن فوائدها ومخاطرها. Globally, the prevalence rate of obesity is increasing. It is estimated that approximately 2 billion people worldwide are classified as overweight or obese. Obesity is associated with many health disorders, including heart diseases and endocrine disorders, notably diabetes mellitus and dyslipidemia. Management of this health problem is diversified, from non-pharmacological treatments such as lifestyle and diet control to pharmacological treatment by medicines and, in some circumstances, surgical intervention intervention. In many cases, surgery and pharmacological medicines may not be the treatment modalities. In general, people use different methods to avoid the side effects and/or failure of conventional medicines for weight loss, such as meal replacement preparations, sport and herbs. Herbs are considered one of the most common alternative therapies for weight loss worldwide. A majority of these herbs are used as a crude plant, and in recent years, herbs have been used worldwide to treat obesity. Many studies have investigated the efficacy and safety of medicinal plants in the treatment of obesity, dyslipidemia and diabetes mellitus., Chinese studies have reported the efficacy and safety of some herbal medicines for weight loss., Many plants have been shown to possess antiobesity effects, including black Chinese tea, green tea and nigella sativa. A study conducted on a South African population to determine the usage rate of traditional herbal medicines in hypertensive patients found that usage had increased due to the safety of herbal medicines. According to an early study, the prevalence of obesity in Saudi Arabia was 22.1%, with a higher rate in females (26.6%) than males (17.8%). In Saudi Arabia, herbal medicines are freely available in both pharmacies (registered products) and herbal remedy shops (unregistered products). This encourages the usage of herbal medicines in Saudi communities. Two studies revealed that traditional herbal medicines are commonly used in the treatment of pediatric illnesses and cancer., To the best of our knowledge, this study is the first one to investigate the use of herbal medicines in obese or overweight people in Taif area. The aim of this study was to determine the usage rate of herbal medicines in Taif and which plants were most commonly used to treat obesity. A cross-sectional survey was conducted on a community in Taif, Saudi Arabia, over a period of 4 months from January to April 2015. A total of 700 questionnaires were distributed to the participants. Inclusion criteria included a body mass index (BMI) above 25 and an ability to read and write Arabic. Ethical approval for this study was obtained from the College of Pharmacy Committee, Taif University. Informed verbal consent was obtained from each participant before completing the questionnaire. Parental permission was obtained for children and adolescents (i.e., for all those under the age of 18 years). Data collection was carried out using a structured self-administered questionnaire that was developed after an extensive literature review from related studies. The survey tool was pretested for content validation and consistency through a pilot study. However, the results of the pilot study were not included in this study. The questionnaire consisted of two parts: the first section contained the respondents' demographic information such as age, gender, nationality and education level and the participants' history of obesity. The second section contained data on the usage of herbal medicines for the treatment of obesity; its name, method of use, frequency, whether the plant was prescribed by a doctor and the patient's experience with herbal medicines. Data collection was carried out in different areas of Taif, including shopping centers, large malls and housing areas. The participants were informed that their participation was voluntary and that the data would be treated as confidential and only used for research purposes. The participants' BMI was calculated by measuring weight and length to confirm their eligibility to participate in the study. Statistical Package for Social Sciences (SPSS) (released 2009 version 18. Chicage, USA), was used for analysis of the data. Descriptive analysis included mean, frequencies and percentages for each variable. A total of 700 questionnaires were distributed to participants, of which 422 (60.3%) were completed. Almost one-third of the respondents 146 (34.6%) were in the age group of 30–39 years, while more than one-third were in the age group of 20–29 years. Slightly more than half of the participants (217, 51.4%) were female. A majority of the subjects were Saudi (392, 92.9%). Exactly two-thirds of the participants (281, 66.6%) were from urban areas. More than half of the respondents (227, 54.1%) were secondary school educated and 27.4% were university educated [Table 1]. 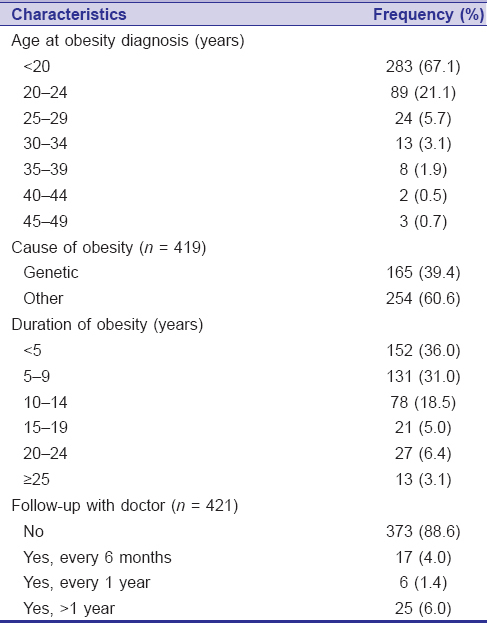 [Table 2] shows that almost two-thirds (283, 67.1%) of respondents reported that they became obese before the age of 20, while 21.1% became obese between 20 and 24 years of age. Based on the history of parental obesity, genetic causes were responsible for 165 (39.4%) cases of obesity. The majority (373, 88.6%) of obese participants reported that they had not consulted a physician for treatment of their obesity. [Table 3] shows that a majority of patients (414, 98.1%) were using herbal medicines to decrease their weight. The most commonly used herb was green tea (373, 88.4%). In an attempt to lose weight, vegetables, fruits and ginger were used by 177 (42%), 157 (37.2%) and 124 (29.5%) of the participants, respectively. 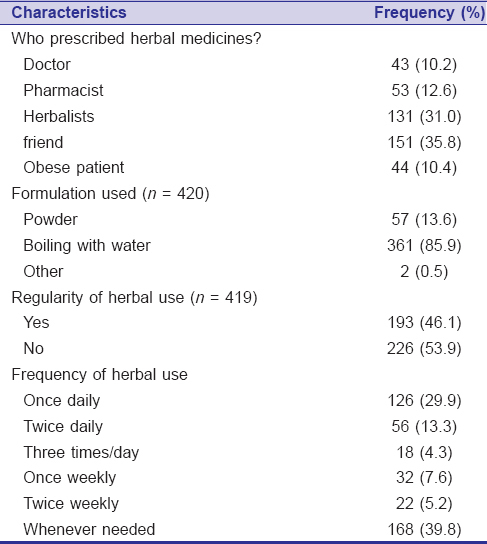 [Table 4] shows that friends (151, 35.8%) and herbalists (131, 31.0%) were the most common herbal advisors. Only 43 (10.2%) and 53 (12.6%) of patients admitted that their herbal advisors were physicians and pharmacists, respectively. A total of 361 (85.9%) participants reported that they prepared herbs by mixing them with boiling water. Less than half of the participants (193, 46.1%), reported that they used herbs regularly. As shown in [Table 5], slightly more than one-third (150, 35.5%) of participants suffered from the side effects of herbal medicine. The most common reported side effects were diarrhea (81, 50.4%), headache (38, 23.6%) and abdominal pain (29, 18%). However, 254 (61.4%) participants had not informed their physicians about these side effects. 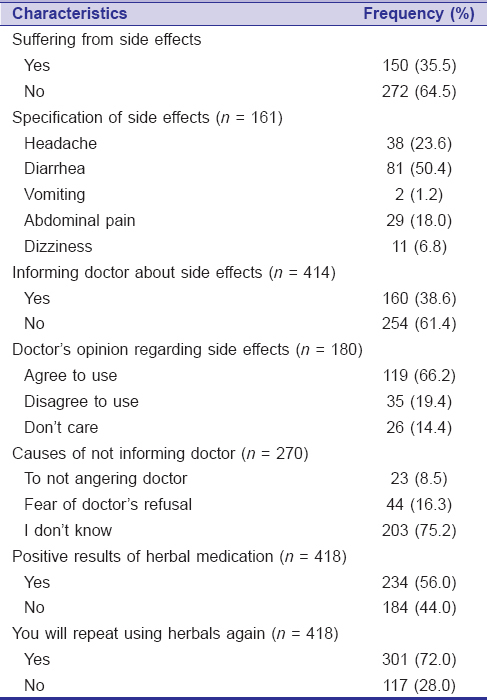 In contrast, 234 participants (56%) reported positive results from taking herbal medications. From the studied group, 310 (72%) of patients admitted that they would use herbal medications again. Obesity has become a worldwide problem creating a wide range of adverse health conditions, particularly in adolescents and young adults. Advertisements through the media encourage young people to lose weight to emulate media personalities, which encourages obese people to use medications, including drugs and/or herbs, to lose weight. In the current study, 98.1% of respondents used herbal medicines to lose weight. This usage rate was significantly higher than that reported for an obese Iranian population (32.3%). Bertisch et al. reported that 36% of obese patients in the USA had used complementary and alternative medicines. The high usage rate of herbal medicines in Saudi Arabia reflects the traditional management of obesity. The majority of the obese participants had not consulted a physician before using herbs to lose weight. Their advisors were either friends or herbalists. This result is in line with an Iranian study, which reported that 60% of patients admitted that friends and relatives, followed by the internet, were the major sources of information on the use of herbal medicines to manage obesity. About 80% of Indian patients suffering from metabolic disorders managed their illnesses through self-medication or self-diet management. A study conducted in Brazil reported that only a few students used antiobesity medicines, but more than two-thirds were self-medicating. Another study revealed that more than half of obese or overweight patients in Colombia self-managed their obesity. Many people prefer to use herbal medicines over conventional medications for weight loss due to the availability of herbs; they can be obtained without a prescription and are usually less expensive and have fewer side effects. In the current study, more than one-third of participants who were using herbal medicines suffered from side effects; however, most of them had not informed their doctors. This was in agreement with a report by Simaan, which reported that herbal medicines did not have therapeutic benefits, toxicities and interactions. Although herbal medicines sometimes have minor therapeutic effects and some interactions, they also have side effects. Most of the participants admitted that they would start or continue to use herbal plants in the future. The study revealed a high usage rate of herbal medicines to treat obesity in Taif. Green tea was the most frequently used herbal medicine. Further studies on the risks and benefits of such treatment are needed. A community-based awareness program through different media should be conducted to publicize the benefits and risks of using herbal medicines. The authors greatly acknowledge Dr. Mustafa Awad for his assistance in data analysis. Roh C, Jung U. Screening of crude plant extracts with anti-obesity activity. Int J Mol Sci 2012;13:1710-9. Hardeman W, Griffin S, Johnston M, Kinmonth AL, Wareham NJ. Interventions to prevent weight gain: A systematic review of psychological models and behaviour change methods. Int J Obes Relat Metab Disord 2000;24:131-43. Liu JP, Zhang M, Wang WY, Grimsgaard S. Chinese herbal medicines for type 2 diabetes mellitus. Cochrane Database Syst Rev 2004;3:CD003642. Barnes PM, Powell-Griner E, McFann K, Nahin RL. Complementary and alternative medicine use among adults: United States, 2002. Adv Data 2004;27:1-19. Han L, Kimura Y, Okuda H. Anti-obesity effects of natural products. Stud Nat Prod Chem 2005;30:79-110. Hasani-Ranjbar S, Larijani B, Abdollahi M. A systematic review of the potential herbal sources of future drugs effective in oxidant-related diseases. Inflamm Allergy Drug Targets 2009;8:2-10. Hasani-Ranjbar S, Nayebi N, Moradi L, Mehri A, Larijani B, Abdollahi M. The efficacy and safety of herbal medicines used in the treatment of hyperlipidemia; a systematic review. Curr Pharm Des 2010;16:2935-47. Hioki C, Yoshimoto K, Yoshida T. Efficacy of bofu-tsusho-san, an oriental herbal medicine, in obese Japanese women with impaired glucose tolerance. Clin Exp Pharmacol Physiol 2004;31:614-9. Lenon GB, Li KX, Chang YH, Yang AW, Da Costa C, Li CG, et al. Efficacy and safety of a chinese herbal medicine formula (RCM-104) in the management of simple obesity: A randomized, placebo-controlled clinical trial. Evid Based Complement Alternat Med 2012;2012:435702. Hughes GD, Aboyade OM, Clark BL, Puoane TR. The prevalence of traditional herbal medicine use among hypertensives living in South African communities. BMC Complement Altern Med 2013;13:38.
al-Nuaim AA, Bamgboye EA, al-Rubeaan KA, al-Mazrou Y. 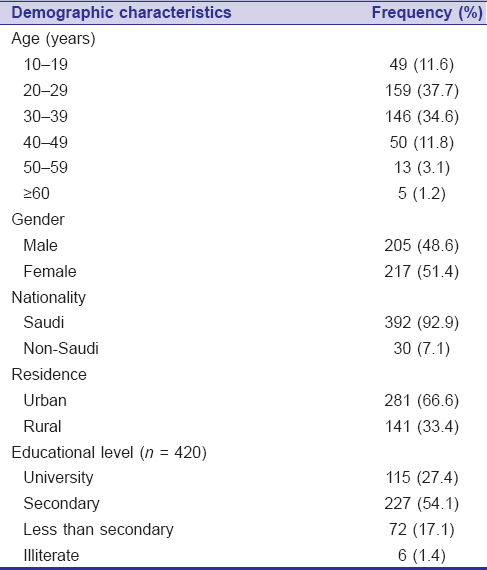 Overweight and obesity in Saudi Arabian adult population, role of socio-demographic variables. J Community Health 1997;22:211-23. Al-Arifi MN. Availability and needs of herbal medicinal information resources at community pharmacy, Riyadh region, Saudi Arabia. Saudi Pharm J 2013;21:351-60. El-Mawla AM, Albarrag AA, Abdallah MA. Herbal medicine use in a group Taif children, Saudi Arabia. Spatula DD 2013;3:41-4. Jazieh AR, Al Sudairy R, Abulkhair O, Alaskar A, Al Safi F, Sheblaq N, et al. Use of complementary and alternative medicine by patients with cancer in Saudi Arabia. J Altern Complement Med 2012;18:1045-9. Fazelian S, Namazi N, Heshmati J. Self-treatment with anti-obesity medications in overweight and obese women in Tehran-Iran. Res J Recent Sci 2014;3:23-7. Bertisch SM, Wee CC, McCarthy EP. Use of complementary and alternative therapies by overweight and obese adults. Obesity (Silver Spring) 2008;16:1610-5. Iso H, Date C, Wakai K, Fukui M, Tamakoshi A; JACC Study Group. The relationship between green tea and total caffeine intake and risk for self-reported type 2 diabetes among Japanese adults. Ann Intern Med 2006;144:554-62. Wu CH, Lu FH, Chang CS, Chang TC, Wang RH, Chang CJ. Relationship among habitual tea consumption, percent body fat, and body fat distribution. Obes Res 2003;11:1088-95. Huang J, Wang Y, Xie Z, Zhou Y, Zhang Y, Wan X. The anti-obesity effects of green tea in human intervention and basic molecular studies. Eur J Clin Nutr 2014;68:1075-87. Sushama S, Nandita T. Study on self-medication and self diet-management by women of Indore city, India. Res J Recent Sci 2012;1:254-356. Martin S, Schneider B, Heinemann L, Lodwig V, Kurth HJ, Kolb H, et al. Self-monitoring of blood glucose in type 2 diabetes and long-term outcome: An epidemiological cohort study. Diabetologia 2006;49:271-8. Amariles P, González LI, Giraldo NA. Prevalence of self-treatment with complementary products and therapies for weight loss: A randomized, cross-sectional study in overweight and obese patients in Colombia. Curr Ther Res Clin Exp 2006;67:66-78. Chandrasekaran CV, Vijayalakshmi MA, Prakash K, Bansal VS, Meenakshi J, Amit A. Review article: Herbal approach for obesity management. Am J Plant Sci 2012;3:1003-14. Simaan JA. Herbal medicine, what physicians need to know. J Med Liban 2009;57:215-7.